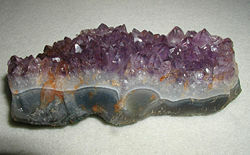 A bed of amethyst crystals on base rock, 13 centimeters (5 inches) long. Amethyst is a violet or purple variety of quartz often used as an ornamental stone. The name comes from the Greek words a (not) and methuskein ("to intoxicate"), referring to the belief that this gemstone protected its owner from drunkenness. The ancient Greeks and Romans wore amethyst and made drinking vessels of it in the belief that it would prevent intoxication. Others have considered it a symbol of heavenly understanding and of the pioneer in spiritual and material aspects. Once counted among the most valuable gemstones, its commercial value dropped when large deposits of the mineral were discovered in Brazil and other parts of the world. Museum quality piece of amethyst. Amethyst was used as a gemstone by the ancient Egyptians and was largely employed in antiquity for intaglio. Beads of amethyst are found in Anglo-Saxon graves in England. It is a widely distributed mineral, but fine, clear specimens suitable for cutting as ornamental stones are confined to comparatively few localities. Such crystals occur either in the cavities of mineral vein and in granitic rocks, or as a lining in agate geodes. The most commercially significant deposits occur in southern Brazil and neighboring Uruguay. Many of the hollow agates of Brazil and Uruguay contain amethyst crystals in their interior. Madagascar is the third major country to export the stone. Much fine amethyst also comes from Russia, especially from near Mursinka in the Ekaterinburg district, where it occurs in cavities in granitic rocks. 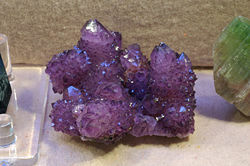 In addition, many localities in India and Sri Lanka yield amethyst. In the United States, amethyst occurs at many sites, but the specimens are rarely fine enough for use in jewelry. Among these locations are Amethyst Mountain, Texas; Yellowstone National Park; Delaware County, Pennsylvania; Haywood County, North Carolina; and Deer Hill and Stow, Maine. It is found also in the Lake Superior region. Amethyst is relatively common in northwestern Ontario and in various locations throughout Nova Scotia, but uncommon elsewhere in Canada. It was selected as the provincial mineral of Ontario in 1975. Although it was traditionally included in the group of cardinal (or most valuable) gemstones (along with diamond, sapphire, ruby, and emerald), amethyst has lost much of its value after the discovery of extensive deposits in locations such as Brazil. As a variety of quartz, amethyst is composed mainly of silica (silicon dioxide, SiO2). Its purple color was once attributed to the presence of manganese. That view, however, has been challenged because it does not explain why the stone changes its color from purple to yellow on exposure to heat. Some, therefore, have attributed the color to the compound ferric thiocyanate, which contains iron and sulfur and is sensitive to heat. Much of the citrine, cairngorm, or yellow quartz of jewelry is said to be merely "burnt amethyst." In addition, veins of amethystine quartz are apt to lose their color on the exposed outcrop. The crystal structure of amethyst differs from that of other quartzes. It consists of an irregular superposition of alternate lamellae (layers) of right-handed and left-handed quartz. Lamellar structures consist of fine, alternating layers of different materials. It has been shown that this structure may be a result of mechanical stresses. Consequently, amethyst is apt to break with a rippled fracture. Some mineralogists, following Sir David Brewster, apply the name amethyst to all quartz that exhibits this structure, regardless of color. Amethyst has a hardness of 7 on the Mohs scale and is therefore valued for use in jewelry. It is, however, just one-fifteenth the hardness of diamond. A 6-carat (1.2-gram) pear-shaped amethyst ring. Amethyst is found in varying colors that are given different names. For instance, "Rose de France" is usually a pale pinkish lavender or lilac shade—usually the least-sought color. By contrast, the most prized color is an intense violet with red flashes and is called "Siberian," although gems of this color may occur from several locations other than Siberia, notably Uruguay and Zambia. More recently, certain gems (usually of Bolivian origin) that have alternate bands of amethyst purple with citrine orange have been given the name "ametrine." 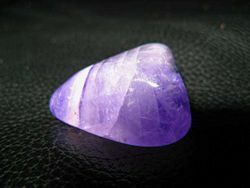 Purple corundum, or sapphire of amethystine tint, is sometimes called "Oriental amethyst," but jewelers may use this term in referring to fine examples of ordinary amethystine quartz, even when not derived from eastern sources. Professional gemological associations—such as the Gemological Institute of America (GIA) or the American Gemological Society (AGS)—discourage the use of the term "Oriental amethyst" to describe any gem, as it may be misleading. Amethyst is the birthstone associated with February. It has also been associated with the astrological signs of Pisces, Aries, Aquarius, and Sagittarius. Based on the belief that amethyst was a strong antidote against drunkenness, wine goblets were often carved from it. Some have considered amethyst a symbol of heavenly understanding, and as a mark of the pioneer in thought and action on the philosophical, religious, spiritual, and material planes. Ranking members of the Roman Catholic Church traditionally wear rings set with a large amethyst as part of their office. The origin of amethyst is told in different legends. According to one Greek myth, when a drunken Dionysus (the Thracian god of wine) was pursuing a maiden named Amethystos, she refused his affections and prayed to the gods to remain chaste. The goddess Artemis granted the prayer and transformed her into a white stone. Humbled by Amethystos' desire to remain chaste, Dionysus poured wine over the stone, dyeing the crystals purple. In another legend, Dionysus was angered by an insult from a mere mortal and created fierce tigers to attack the next mortal who crossed his path. Along came unsuspecting Amethyst, a beautiful young maiden on her way to pay tribute to the goddess Diana. To protect Amethyst from the animals, Diana turned her into a statue of pure crystalline quartz. At the sight of this beautiful statue, Dionysus wept tears of wine in remorse for his action, and his tears stained the quartz purple, creating the gem we know today. Weinstein, Michael. 1967. The World of Jewel Stones. New York: Sheridan House. Much of the original version of this article was taken from the Encyclopædia Britannica Eleventh Edition, a publication now in the public domain. Amethyst "Gem by Gem" series, International Colored Gemstone Association. This page was last modified on 18 March 2019, at 15:33.